A balanced and nutritious dinner made all in one pan? Yes, please! If you’ve never tried this technique, now is your chance! 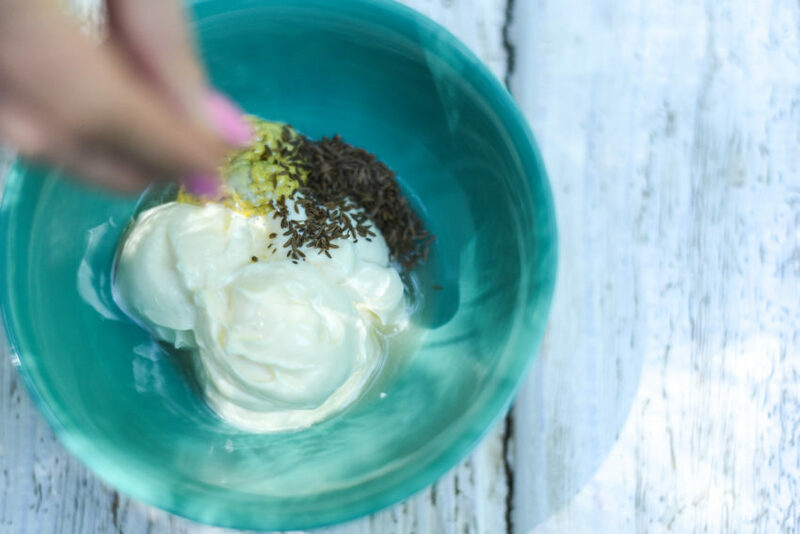 I hope you start with this recipe, because it is easy, delicious, and highlights the flavors coming up: end of summer and beginning of fall. 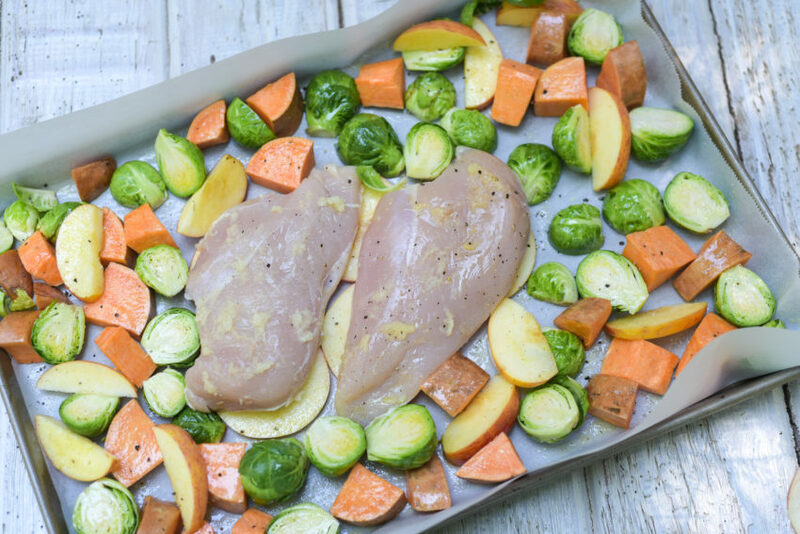 To do a one-pan dinner, I like to put the protein in the middle – in this case 1 pound of boneless, skinless chicken breast. I place the protein on top of sliced apples, and then cover it in…garlic. Yummy already, right? Put that in the oven on high heat – 425º. And now for the star of the recipe…Cider Mustard Sauce. You will be amazed at how delicious 4 easy ingredients can be together. 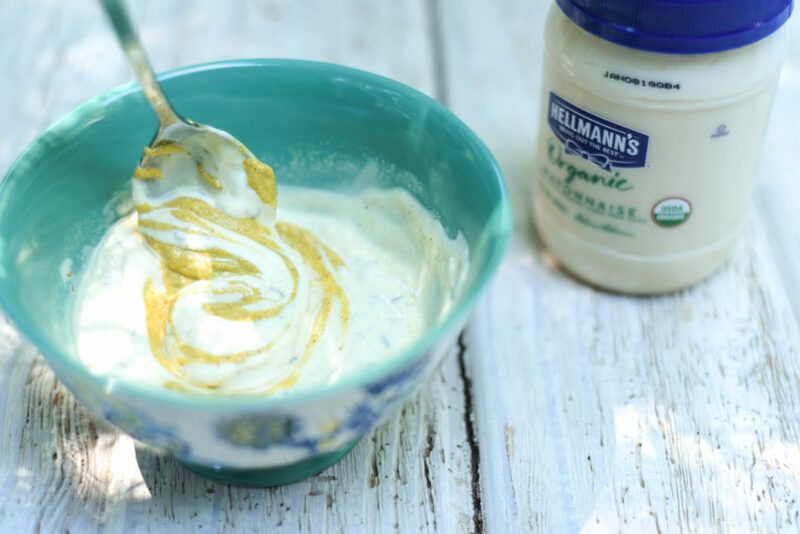 In this case, it starts with Hellmann’s® Organic Mayonnaise. And sprinkle in raw cider vinegar, spicy brown mustard, and caraway seeds…the best combination for a fall sauce. As an Agent of Change with Unilever, I learned that Hellmann’s® Organic uses 100% organic cage-free eggs and expeller-pressed organic oil.. It also is free from GMOs and contains Omega-3 fats, otherwise called alpha-linolenic acids. I think it makes a perfect sauce to bring together plants and proteins, one of the most satisfying and nutritious dinners you can ask for. Serve with the Cider Mustard Sauce dripped over. It. Is. So. Yummy. 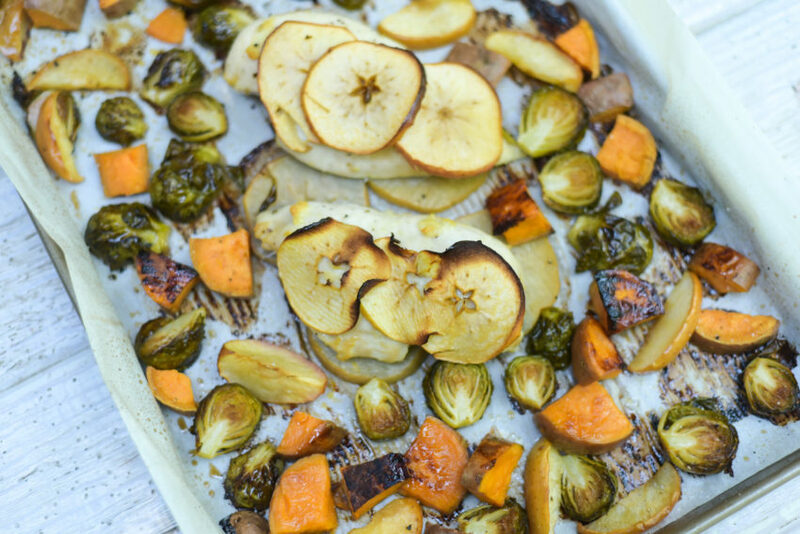 I can (pretty much) promise that this will be a fall staple dinner in your house. 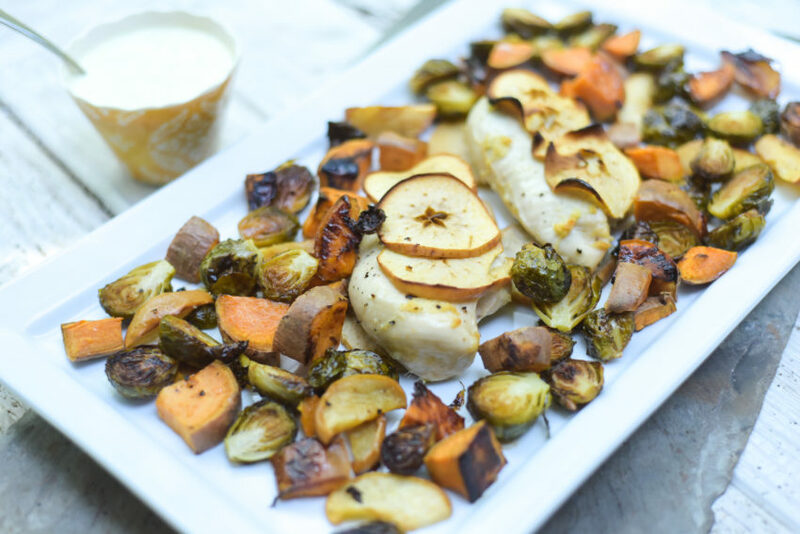 Share this recipe with anyone trying to eat healthier! It makes an easy weeknight dinner, and is perfect for diabetics and those on a weight-loss journey. I would love to support your healthy cooking by connecting with you on Facebook, Instagram, and Pinterest. 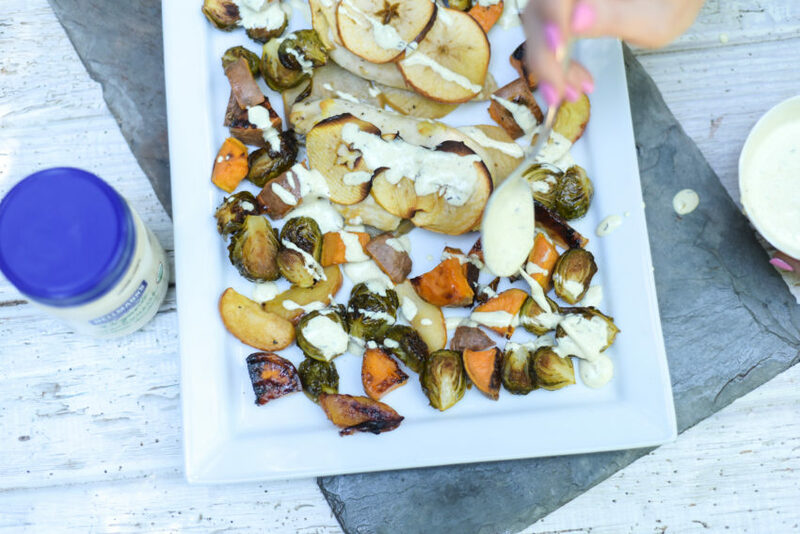 Here’s to a delicious, nutritious easy dinner! 1. Preheat oven to 425 degrees F. Slice 2 apples horizontally into 8 rounds. 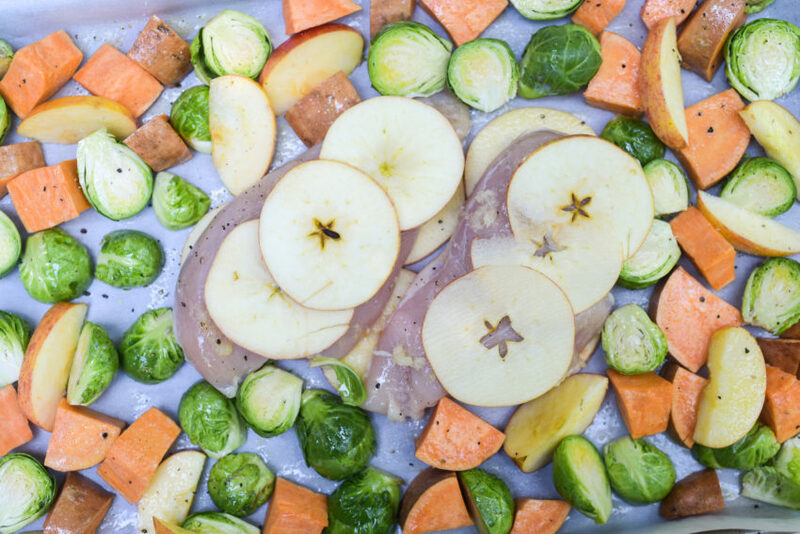 On a baking sheet lined with parchment paper, add 4 apple slices to the middle of the pan. Lay chicken breast on top of the apples. Spread 1 clove of grated garlic over the chicken breast and sprinkle with salt. Lay the other slices of apple on top of the chicken breast. 2. 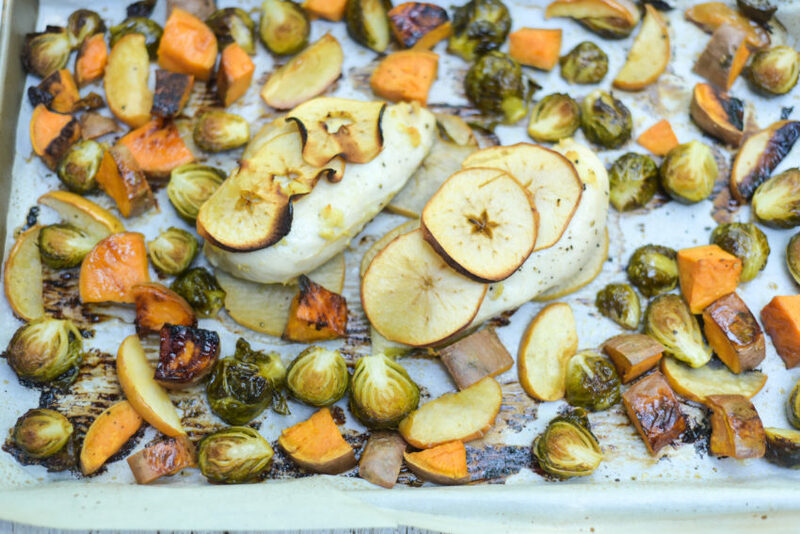 Spread Brussels sprouts, sweet potatoes on the pan around the chicken. Slice the final apple into wedges, and add it to the baking sheet. Toss the vegetables with olive oil and 1/2 teaspoon kosher salt, so that they are all evenly coated. Arrange the vegetables so that they are in a single layer around the chicken. 3. Place in oven and bake for 40 minutes, until vegetables are fork-tender, and chicken is cooked through. 4. While chicken is baking, make Cider Mustard Sauce: combine all ingredients into a small bowl and stir. Add just enough water (2-3 tablespoons) to thin it out so sauce can be drizzled on top of chicken. 5. Remove One-Pan Chicken to a serving plate, with vegetables all around. Drizzle sauce on top of chicken or serve it on the side. Enjoy!